Despite WhatsApp’s widespread popularity, many people looking for a solid instant messaging service on their mobile devices like to experiment with WhatsApp alternatives, just to see if the grass is greener. Others simply dislike WhatsApp, with the $0.99 one-off fee for the application not helping their standing with skeptical users, especially when they know there are free alternatives. Whatever your reasons for seeking out WhatsApp alternatives, you can rest assured that there is indeed a fair amount of competitors to choose between, all of which offer a little something different. To help narrow your search, here is a list of the top five WhatsApp alternatives, for both iOS and Android devices. What’s more is, they’re all completely free. One of the most widely used instant messaging services after WhatsApp is Viber. The free application offers some excellent communication features, which include free texts and Internet calls. Viber users can also send videos and images, use emoticons, create chat groups, and more. The social aspect of WhatsApp is not lost either, as profile images can be used, which Viber offers to take from your Facebook to speed up the process. iOS users can find our complete guide for Viber here. Much like Viber, Line allows you to make free Internet calls, and send free instant messages to friends and family all over the world. You can even continue conversations via their desktop application. However, Line takes a much more social approach leaving both Viber and WhatsApp in its wake when it comes to networking. For example, you can update your location, use text status updates, share photos, and more. You can even check your Line timeline, which lists the recent activity of your contacts. It isn’t uncommon to find instant messaging applications full of whacky cartoon emoticons and messy menu interfaces. Thankfully, Kik truly offers a clean, crisp and more simple approach to mobile messaging. The sleek, attractive menus and chat interface make it easy to share images, videos and more. Another unique feature is the way in which you only need to share your Kik username, unlike with other applications, where your personal phone number needs to be divulged. As the name suggests, GroupMe is perfect for users who wish to either chat with a large group or keep contacts grouped into categories for easy access. The developers have likened it to a “private Twitter” allowing you to keep tabs on selected people who wish to share information with you about a certain subject within a GroupMe group chat session. Along with all the usual features including image, video and text sharing, GroupMe has some cool extras. These include being able to add your location to all your messages, giving groups avatars, and even “Liking” the messages of your friends and family. Skype is another application which is bursting with functionality. As many already know, Skype has widely used n desktop devices and can be used to chat across multiple platforms. For example, with Skype, you can message or video chat from your iPhone with your Uncle who is using his Laptop. As well as this, you can use Skype to make Internet calls over both 3G and WiFi, share images, videos, and of course, instant message. On top of these features, there are even ways in which Skype can save you money. 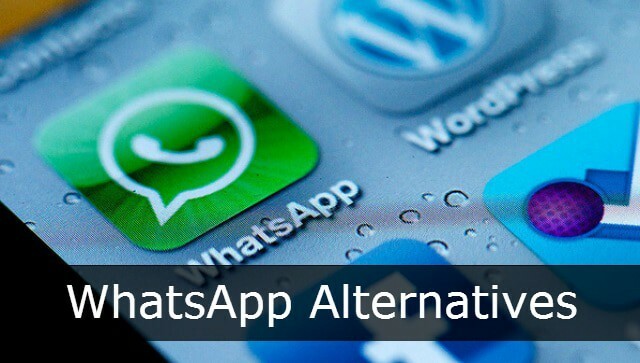 And there you have it, five of the very best iOS and Android WhatsApp alternatives which offer similar, and in some cases, even more, functionality than WhatsApp itself. To sweeten the deal, the apps listed above are not obscure, in the sense that you’ll probably realize after installation that much of your phonebook also have the same app running on their devices. So, if you are hesitant to pay for instant messaging apps, dislike WhatsApp’s interface or stability, or simply wish to try something new, these completely free alternatives should serve you pretty well.